Dorothy Day, the founder of the Catholic Worker Movement, once proclaimed, “the world will be saved by beauty.” Mary Beth Appel and Johanna Berrigan practice this philosophy every day through their work to nurture the lovely House of Grace Catholic Worker Garden in Philadelphia’s East Kensington neighborhood. The Hous e of Grace Garden encompasses eight lots on East Oakdale Street, in an area where many are struggling with poverty, addiction and homelessness. As a medical practitioner who serves this community, Johanna sees the therapeutic qualities that a green space like the House of Grace Garden provides. Johanna and Mary Beth have been striving to cultivate and share the curative powers of the garden since they moved to Kensington in 1994. At that time, they took on the massive task of cleaning up these abandoned properties, which had attracted dumping and crime. and transformed them into a place of beauty, abundance and calm. The garden is divided by one standing house. Mary Beth and Johanna had worked with this challenge by incorporating it into the design of garden. The wall of the house brightens the garden with a colorful mural of the Peaceable Kingdom. One side of the garden is dedicated to the cultivation of organic vegetables, berries, herbs, and flowers. The other side is a peaceful refuge with shady trees, a labyrinth for walking meditation, and a memorial for community members who have passed. While Mary Beth and Johanna are the stewards who have kept the garden stable through its 24-year history, hundreds of others have also contributed their time and talents to shape and care for the space. Some of the guests in the “house of hospitality” that Mary Beth and Johanna operate to serve people in need of shelter, also enjoy working in the garden. Many peace and justice groups and college students have also volunteered their labor to care for the garden. In the 1990s and early 2000s, the garden organizers did not think about land security for the garden. Homes on East Oakdale Street were selling for around $5,000. “Never in a million years did we think there would be a problem,” Mary Beth says, reflecting on the decision to squat on the land and put it to good use to benefit the community. Ten years ago, they were invited to a meeting to discuss a proposed development of 40 new housing units on the block, which would have required demolishing existing homes as well as the garden. Fortunately, these plans never materialized, but it brought the issue of land security for the garden to the forefront. Mary Beth and Johanna tried to contact property owners and applied for ownership through different City programs. It seemed every time they got close to securing the parcels, a new mayor would get elected and they would have to start the process over again. 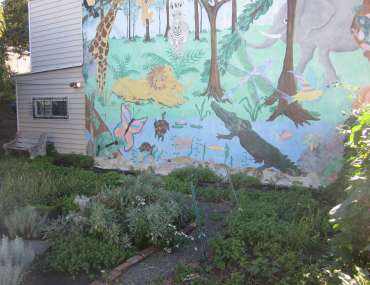 They began to interact with the former Neighborhood Gardens Association, which at that time placed them on a wait list. In 2014, when Mary Beth read about the relaunch of the Neighborhood Gardens Trust she reapplied for preservation. The neighborhood around the garden was beginning to see more new development and there was a true sense of urgency now to secure permanent land tenure. Finally, the time was right. NGT had the capacity now and was working to bring more gardens into its protection. The eight properties had been consolidated under the ownership of the Philadelphia Redevelopment Authority (PRA) which would make land assembly much easier. With the support of Councilman Mark Squilla, NGT was able to work through the approval process to acquire the land from the PRA. In November, NGT went to the settlement table with the PRA to secure title for the House of Grace Garden. After so many years of hard work and worry, Mary Beth watched as the documents were signed and the garden was saved. Now that the garden has been preserved and NGT has insured it, Johanna and Mary Beth are excited to share the space with more neighbors. They also have plans to introduce a Zen garden. “It’s like a 24-year dream come true,” Johanna beams. “We are delighted about NGT,” Mary Beth chimes in.